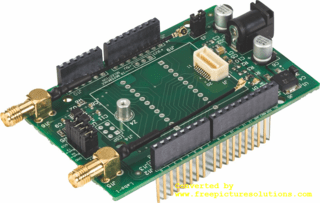 - Add cellular modem connectivity to your Arduino based hardware solutions. - The BitPipe� Shield is designed to provide easy integration of BitPipe� Modem Family modules onto an Arduino platform. - The BitPipe� Shield can be used as-is in your integrated solution, or can serve as a stepping-stone in designing your own hardware solution. - Use the BitPipe� Arduino SDK to command and control the BitPipe� modem. Library files allow you to easily communicate data or messages using HTTP, TCP/IP, SMS or MQTT over cellular networks. - Ideally suited for hardware and software engineers, integrators, students and hobbyists familiar with Arduino platforms. Note: BitPipe� modem and Arduino board sold separately.